Parking is free for all Zoo guests. All others are asked to pay a $2.00 donation to the payment box at the parking lot entrance. 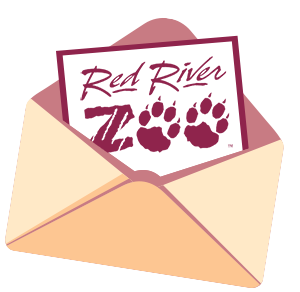 The Red River Zoo focuses on animals native to areas with similar climates. Our collection includes animals from northern Asia and northern North America, including Chinese Red Pandas and Grey Wolves. We also have a variety of reptiles, amphibians, and invertebrates from around the world. Also, an indoor exhibit includes an Armadillo, two White Faced Saki monkeys, and a two-toed Sloth from South America. Yes! We encourage guests to take personal photos during their Zoo visit. But as a not-for-profit organization, commercial use of photos taken at our facility is strictly prohibited, unless given express, written permission. There are no restrictions other than please be courteous to other guests who may wish to get a close look as well. And please remember, do not harass the animals in order to get their attention. May I bring my pet to the Zoo? Unfortunately, no. The Zoo is considered a quarantine facility in order to protect the health of the animal collection. The only animals allowed inside the Zoo are working animals, in accordance with AZA regulations. Can I bring outside food into the Zoo? The Red River Zoo does not allow outside food and beverages into the park. We offer concession items at the Dancing Crane Cafe, the Carousel Pavilion, and the Wild Things Gift Shop. Zoo admission is valid for the entire day it is purchased, and we do allow guests to exit and re-enter the Zoo should they choose to go dine off site. Respect the animals by not chasing, harassing, yelling, or tapping on exhibit glass. No food or drink may be brought into the zoo unless the carousel pavilion has been reserved for a lunch break. Cost for reserving the pavilion is available upon request. Do not throw objects, including food, into exhibits. Visitors must remain on the pathways and off the grass for safety of visitors and animals. Do not feed the animals anything other than animal feed from coin feeders. Animal feed for the domestic animals and ducks is available for $.25 (quarters only). No pets are allowed on Zoo grounds. No smoking on Zoo grounds.